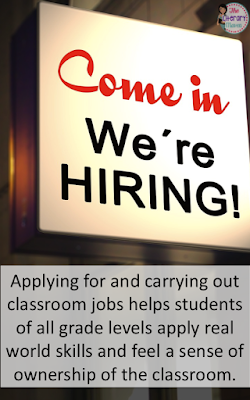 Every elementary school classroom has a job chart and eager students willing to take on those jobs. But what about middle school and high school students? Are they less willing to be helpful? Are they lacking the desire to feel ownership in the classroom? My answer to both of those questions would be no. Students want to feel useful and a sense of belonging in the classroom regardless of grade level. 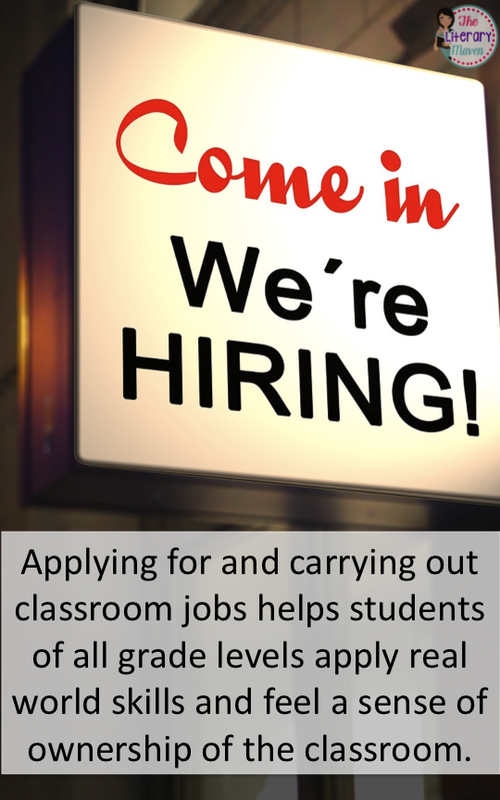 Giving secondary students classroom jobs not only meets these needs, but also takes a few tasks off your plate, allowing you to focus more on instruction. 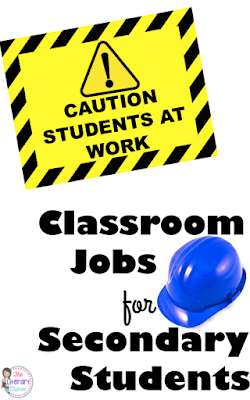 At the start of the school year or whenever you come to the realization that classroom jobs will be beneficial for you and your students, make a list of jobs for your classroom. I'll share some ideas below, but think about all the things you do around your classroom that take away from the time you could spend teaching. Use that list of jobs you generated to create an application for students. You may want to include a brief description of each job, especially those that are not self-explanatory. You can ask students to explain why they think they would be a good fit for each position they are interested in and to list any relevant experience. These questions encourage students to think the way they will have to when applying for a real job. On the application, have students rank their desired jobs, as many as they'd like, in order of preference. You can find a free application and "Wanted" poster to help you get started here. Decide how often you will change the jobs: once a month, once a marking period, or not at all. Then make a schedule filling in the students interested in each position, doing your best to accommodate students' rankings. If a student doesn't get their #1 job in the first round of jobs, maybe they will the second or third round. You can post this schedule in your classroom for students to reference. When it comes time for students to change jobs, have the present job holder notify and train the incoming job holder so that the only work you do is training students at the start of the year. Allowing students to train each other gives them a sense of pride, has them practice real world skills and helps them take ownership of their classroom; it's up to them to make sure the job is done right. If students are not performing up to your standards, give them a warning and then give them a "lay off" if the issues continue. After about a week, allow them to return to their jobs for a probationary period. If they slip up again during that period, then they are permanently "let go" from their position. While it is just a classroom job, you want students to learn that responsibility should be taken seriously and there is a series of consequences if it isn't, but also the chance to get back on the right track. If students are meeting your standards, consider some sort of payment: extra points toward their grade average, a thank you luncheon at the end of their employment, a book of their choice, etc. 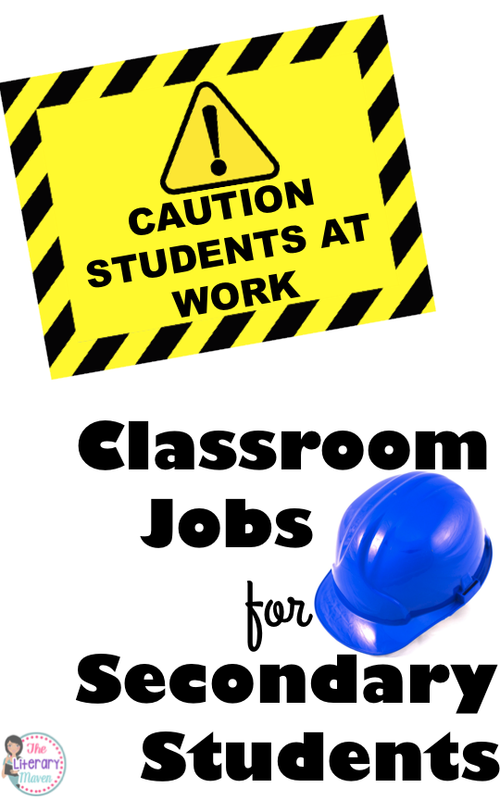 If you are worried that having classroom jobs will distract students and take away from learning, fear not. In my classroom, all jobs (with a few exceptions) are carried out in the first five minutes of the period. During this time all students are responsible for completing the warm up and preparing for class: sharpening pencils, having out homework, etc. Students with jobs still need to prepare themselves for the rest of class, but can complete their warm up orally when I review it rather than writing it down. Not all jobs will need to be done every day, so there will still be days where students do complete a written version of the warm up. If jobs are not completed during the five minute period, most can be continued by the next class or the next day. My warm up is timed so students know that when that timer goes off they need to be back in their seats ready for class to begin. Board cleaner - Specify when and how often you'd like the board erased versus cleaned with board spray. Stapler/hole puncher - Be sure to show students how to properly use both these tools. This includes refilling the stapler, what to do if it jams, and where on papers you want the staple. Similarly, show students how to line papers up in the hole punch, how many sheets of paper will fit at once, and how to empty the punchings. Bulletin board changer - Explain what makes student work appropriate and worthy of display. Then allow students to make the selections and get creative with the layout of the display. Filing clerk - If you keep student work or writing portfolios or have some kind of mailbox system for returning student work, have a student file these papers. Homework checker - If you assign nightly homework, have a student collect it. If you collect homework at the end of the week, but check to see if it is done daily, have a student stamp the assignments for completion or check off names on a check list. Bell ringer checker - As with homework assignments, have a student collect these daily or mark for completion. Maintenance - This can include sweeping up as needed, routinely wiping down desks and tables, cleaning electronics. Indicate to students how often you'd like these tasks done. Tech expert - This position is one where experience is a plus so that the student can be helpful to other students and if needed, to you too. Attendance - If you keep a paper record of attendance, allow a student to complete that for you. If you feel comfortable (and it doesn't violate school policy), have them complete your electronic record as well. Announcements/reminders - At the start or end of class, have a student read off reminders about due dates, upcoming quizzes and tests, and school wide events. Supplies - Instead of students asking you for a pencil, a piece of paper, or a tissue, have one student in charge of these materials. If all of these things are already out in your classroom and accessible to all students, have a students restock when supplies are low and alert you when more supplies need to be purchased. Librarian - Explain your organization and check out system. 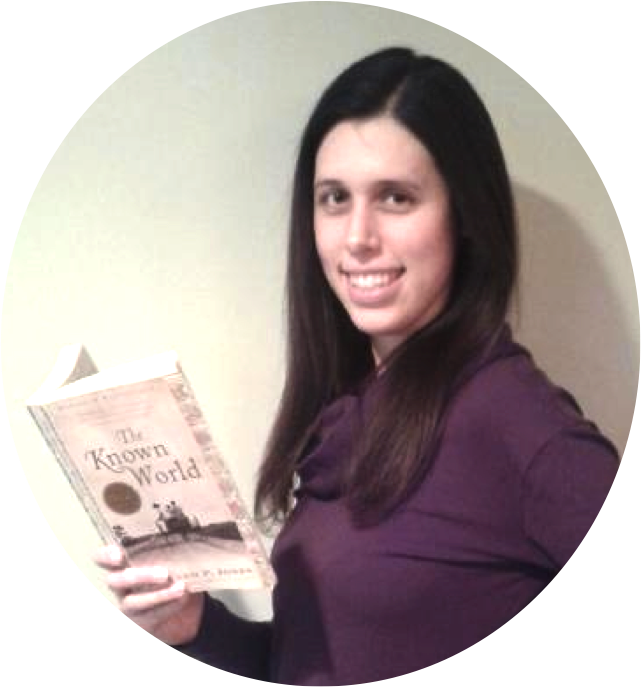 You can also put this student in charge of repairing damaged books. Furniture arranger - Desks have a way of migrating from their spot even if you mark your floor with tape or stickers. Have this student tidy up your rows and push in chairs. Dismissal - If your classroom is one where you dismiss the students, not the bell, put a student in charge of dismissal. It becomes up to them to make sure the room is as it should be before students exit. Let them tell students to clear their desks, pick up those papers on the floor, etc so you don't have to nag. Messenger - It seem like every students' hand goes up when the opportunity to leave the classroom arises. Having a designated messenger will avoid that issue. You may want to assign this job to a fidgety student who will appreciate the chance to move around. Paper collector/passer - Similar to the job of messenger, you may want to assign this job to a student who needs the opportunity to move around a bit. Bathroom manager - Minimizing interruptions to your teaching is what classroom jobs are all about so put this student in charge of filling out the bathroom log if you keep one, issuing paper passes, or handing off your permanent pass. This student will also need to enforce your rules about the number of students that can be out of the room at a time and at what times during class (i.e. not during direct instruction). Time keeper - Give this student a timer or stop watch to keep track of timed activities. They can issue one minute warnings for students to wrap things up and alert you when the class period is about to end. Management - You need someone other than you to make sure student jobs are being completed when and how you want. You can communicate with your manager rather than ten to fifteen individual students. Right hand man - For anything else that might come up or if a student is absent, your right hand man can step right up. Great ideas! I love the idea of an end of year employee luncheon. :) Thanks, Brynn! Is there any kind of incentive or reward to motivate students to participate?